You dog! Kat says Jesse had at least 19 lovers during their courtship. 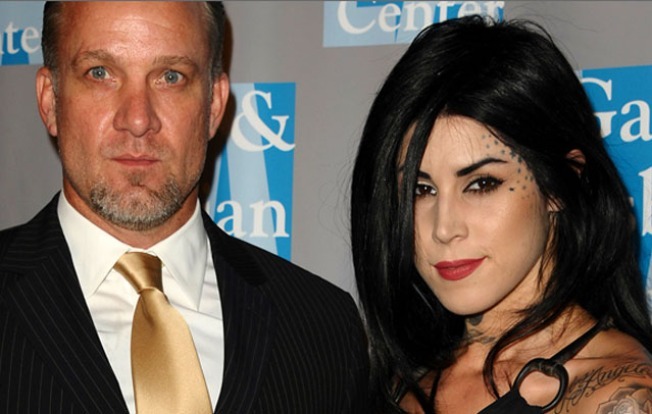 Jesse James, whose infidelity doomed his marriage to Sandra Bullock, cheated on rebound gal Kat Von D with no less than 19 women, the former LA Ink star claims. "Today I encountered the 19th girl to add to the list of people Jesse cheated on me with during this last year," Kat wrote in a blog post on her Facebook page. "I kept going back and forth in my mind as to what the best way would be for me to release and let go of any residual feelings remaining from that toxic relationship." After James and Bullock's marriage imploded due to his incessant tom-catting, James admitted he showed "poor judgment." But Bullock dumped him and James moved on to the tattooed, 29-year-old. And a bunch more at the same time, it seems. James and Von D had been planning to wed last summer, but split. At the time, she said she wished him the best, but now she can't seem to toss a tattoo needle in LA without hitting one of James' paramours. "I tried my best to go through all of this without venting, or complaining, or fueling more tabloid mumbo jumbo," Von D wrote. "[But] this is about me making peace with myself, and forgiving myself for making some bad mistakes." A pal of James told People Von D's "claim is ridiculous."